First, if you need to send passwords to directories other than Azure AD and AD DS, deploy MIM Sync with connectors to Active Directory Domain Services and any additional target systems, configure MIM for password management and deploy the Password Change Notification Service. Then, if you need to send passwords to directories other than Azure AD, configure Azure AD Connect for writing back the new passwords to AD DS. Finally, roll out Azure AD self-service password reset to your end users. For existing customers who had previously deployed Forefront Identity Manager (FIM) for self-service password reset and are licensed for Azure Active Directory Premium, we recommend planning to transition to Azure AD self-service password reset. You can transition end users to Azure AD self-service password reset without needing them to re-register, by synchronizing or setting through PowerShell a user's alternate email address or mobile phone number. After users are registered for Azure AD self-service password reset, the FIM password reset portal can be decommissioned. 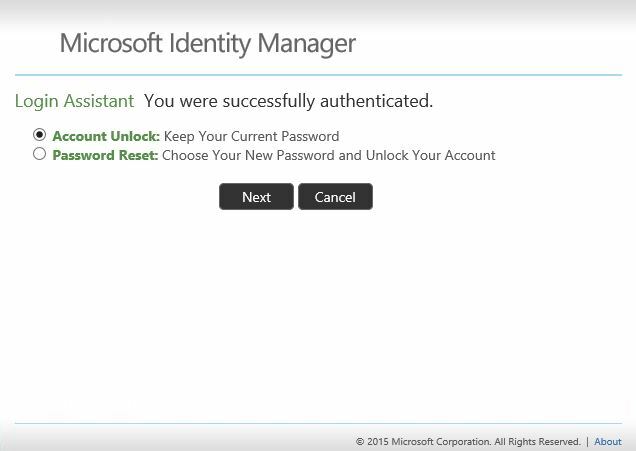 The MIM Self-Service Password Reset portal and Windows login screen let users unlock their accounts without changing their passwords. A new authentication gate, Phone Gate, was added to MIM. 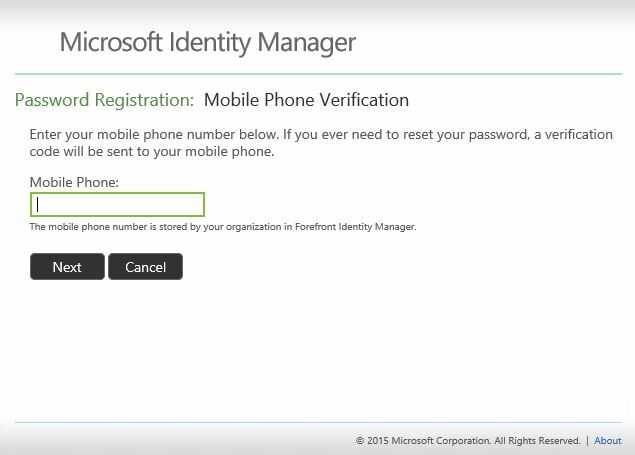 This enables user authentication via telephone call via the Microsoft Azure Multi-Factor Authentication (MFA) service. MIM 2016 release builds up to version 4.5.26.0 relied upon the customer to download the Azure Multi-Factor Authentication Software Development Kit (Azure MFA SDK). That SDK has been deprecated, and the Azure MFA SDK will be supported for existing customers only up until the retirement date of November 14, 2018. Until that date, customers must contact Azure customer support to receive your generated MFA Service Credentials package, as they will be unable to download the Azure MFA SDK. 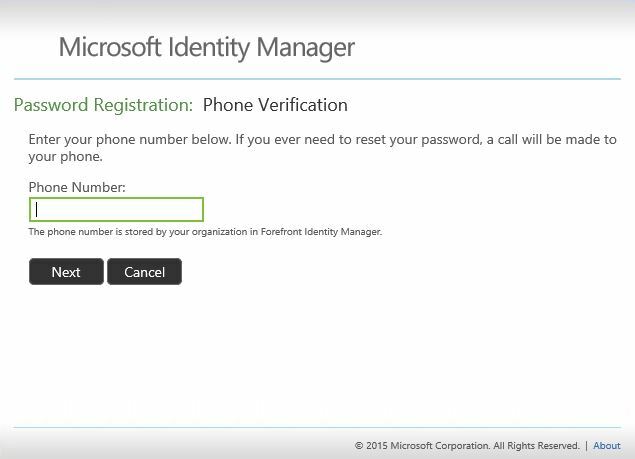 This article describes how to update your deployment MIM self-service password reset portal and PAM configuration, using Azure Multi-Factor Authentication Server for multi-factor authentication. 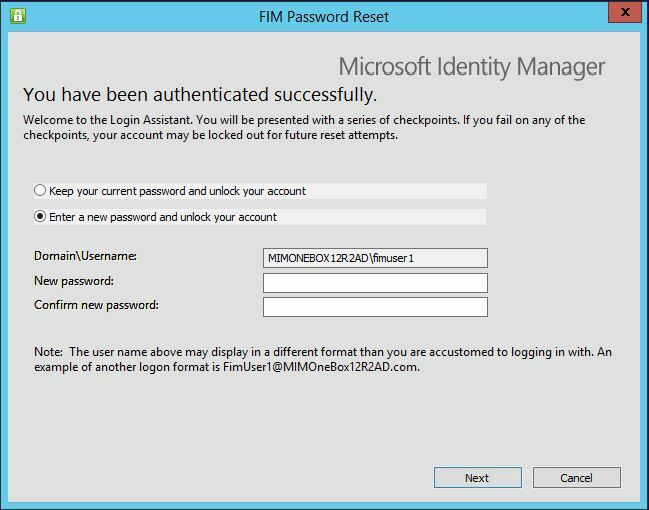 The following section describes how to deploy MIM self-service password reset portal, using Azure MFA for multi-factor authentication. These steps are only necessary for customers who are not using Azure AD self-service password reset for their users. Microsoft Azure Multi-Factor Authentication is an authentication service that requires users to verify their sign-in attempts with a mobile app, phone call, or text message. It is available to use with Microsoft Azure Active Directory, and as a service for cloud and on-prem enterprise applications. Azure MFA provides an additional authentication mechanism that can reinforce existing authentication processes, such as the one carried out by MIM for self-service login assistance. When using Azure MFA, users authenticate with the system in order to verify their identity while trying to regain access to their account and resources. Authentication can be via SMS or via telephone call. The stronger the authentication, the higher the confidence that the person trying to gain access is indeed the real user who owns the identity. Once authenticated, the user can choose a new password to replace the old one. Configuring the Active Directory Management Agent (ADMA) for connectivity to AD DS and capability to import identity data from and export it to Active Directory. Configuring the MIM Management Agent (MIM MA) for connectivity to FIM Service DB and capability to import identity data from and export it to the FIM database. Configuring Synchronization Rules in the MIM Portal to allow user data synchronization and facilitate sync-based activities in the MIM Service. MIM 2016 Add-ins & Extensions including the SSPR Windows Login integrated client is deployed on the server or on a separate client computer. This scenario requires you to have MIM CALs for your users as well as subscription for Azure MFA. In the next section, you will set up your Azure MFA provider in Microsoft Azure Active Directory. As part of this, you’ll generate a file that includes the authentication material which MFA requires to be able to contact Azure MFA. In order to proceed, you will need an Azure subscription. Open a support case and request the direct SDK for ASP.net 2.0 C#. The SDK will only be provided to current users of MIM with MFA because the direct SDK has been deprecated. New customers should adopt the next version of MIM that will integrate with MFA server. Copy the resulting ZIP file to each system where MIM Service is installed. Please be aware that the ZIP file contains keying material which is used to authenticate to the Azure MFA service. Sign into the computer where MIM Service is installed, as the user who installed MIM. Create a new directory folder located below the directory where the MIM Service was installed, such as C:\Program Files\Microsoft Forefront Identity Manager\2010\Service\MfaCerts. Using Windows Explorer, navigate into the \pf\certs folder of the ZIP file downloaded in the previous section, and copy the file cert_key.p12 to the new directory. In the SDK zip file, in the folder \pf, open the file pf_auth.cs. Find these three parameters: LICENSE_KEY, GROUP_KEY, CERT_PASSWORD. In C:\Program Files\Microsoft Forefront Identity Manager\2010\Service, open the file: MfaSettings.xml. 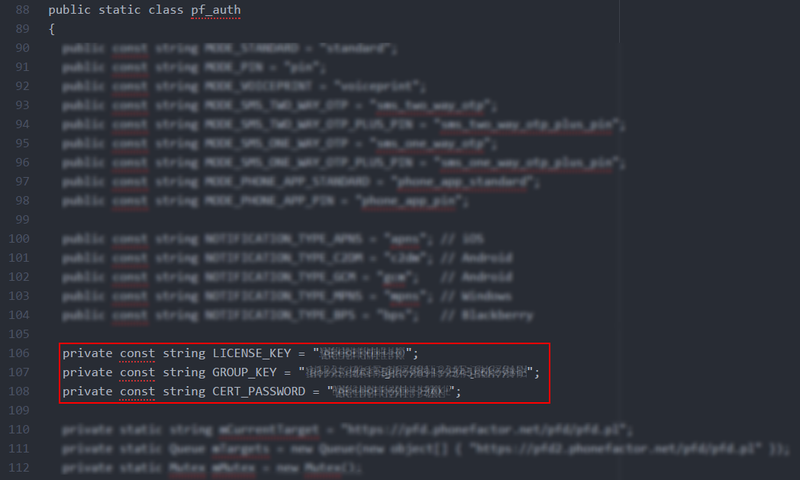 Copy the values from the LICENSE_KEY, GROUP_KEY, CERT_PASSWORD parameters in the pf_aut.cs file into their respective xml elements in the MfaSettings.xml file. In the SDK zip file, under \pf\certs, extract the file cert_key.p12 and enter the full path to it in the MfaSettings.xml file into the <CertFilePath> xml element. In the <username> element enter any username. In the <DefaultCountryCode> element enter your default country code. In case phone-numbers are registered for users without a country code, this is the country code they will get. In case a user has an international country code, it has to be included in the registered phone number. Save the MfaSettings.xml file with the same name in the same location. Launch Internet Explorer and navigate to the MIM Portal, authenticating as the MIM administrator, then click on Workflows in the left hand navigation bar. 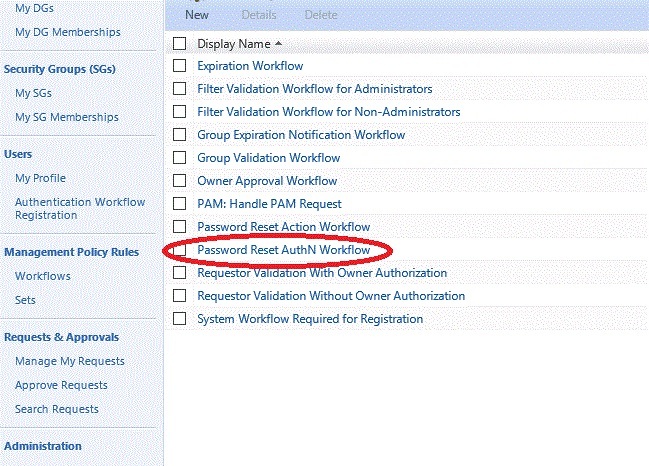 Check Password Reset AuthN Workflow. Click on the Activities tab and then scroll down to Add Activity. Select Phone Gate or One-Time Password SMS Gate click Select and then OK.
Users in your organization can now register for password reset. During this process, they will enter their work phone number or mobile phone number so the system knows how to call them (or send them SMS messages). A user will launch a web browser a navigate to the MIM Password Reset Registration Portal. (Typically this portal will be configured with Windows authentication). Within the portal, they will provide their username and password again to confirm their identity. They need to enter the Password Registration Portal and authenticate using their username and password. In the Phone Number or Mobile Phone field, they have to enter a country code, a space, and the phone number and click Next. How does it work for your users? Now that everything is configured and it’s running, you might want to know what your users are going to have to go through when they reset their passwords right before a vacation and come back only to realize that they completely forgot their passwords. There are two ways a user can use the password reset and account unlock functionality, either from the Windows sign-in screen, or from the self-service portal. By installing the MIM Add-ins and Extensions on a domain joined computer connected over your organizational network to the MIM Service, users can recover from a forgotten password at the desktop login experience. The following steps will walk you through the process. If your user enters the wrong password several times, in the sign-in screen, they will have the option to click Problems logging in? . Clicking this link will take them to the MIM Password Reset screen where they can change their password or unlock their account. The user will be directed to authenticate. If MFA was configured, the user will receive a phone call. In the background, what’s happening is that Azure MFA then places a phone call to the number the user gave when he signed up for the service. When a user answers the phone, they will be asked to press the pound key # on the phone. Then the user clicks Next in the portal. If you set up other gates as well, the user will be asked to provide more information in subsequent screens. If the user is impatient and clicks Next before pressing the pound key #, authentication fails. After successful authentication, the user will be given two options, either unlock the account and keep the current password or to set a new password. Then the user has to enter a new password twice, and the password is reset. Users can open a web browser, navigate to the Password Reset Portal and enter their username and click Next. If MFA was configured, the user will receive a phone call. In the background, what’s happening is that Azure MFA then places a phone call to the number the user gave when he signed up for the service. When a user answers the phone, he will be asked to press the pound key # on the phone. Then the user clicks Next in the portal. The user will have to choose if he wants to reset his password or unlock his account. If he chooses to unlock his account, the account will be unlocked. After successful authentication, the user will be given two options, either to keep his current password or to set a new password. If the user chooses to reset their password, they will have to type in a new password twice and click Next to change the password.